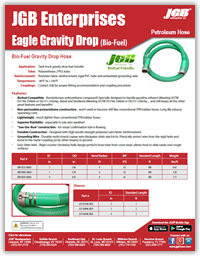 Eagle Gravity Drop (Bio-Fuel) Hose - JGB Private Brand - Hose by Vendor - JGB Enterprises, Inc.
Biofuel Compatible - Revolutionary polyurethane compound! Specially designed to handle gasoline, ethanol (Meeting ASTM D5798, D4806 or D6751 criteria), diesel and biodiesel (Meeting ASTM D5798, D4806 or D6751 criteria) ... and still keeps all the other great features and benefits! Non-permeable polyurethane construction -won’t swell or become stiff like conventional TPR/rubber hoses. Long life reduces operating costs. Lightweight - much lighter than conventional TPR/rubber hoses. Superior flexibility - especially in sub-zero weather! “See-the-flow” construction - for visual confirmation fuel is flowing. Durable Construction - Designed with high tensile strength polyester yarn fabric reinforcement. Grounding Wire - Durable multi-strand copper wire dissipates static electricity. Physically extract wire from the rigid helix and bond to the metal coupling (or by other means) to ground. Easy Slide Helix - Rigid counter clockwise helix design protects hose tube from cover wear; allows hose to slide easily over rough surfaces.